Join me in blessing others this year! When my Father-In-Law turned 81 this week I couldn't resist making him the first Birthday card of the year! Making a fun hand-stamped card is sweet, especially when the Stamp set is FREE!! Score this Free stamp set for YOUR Collection - for a limited time - during Sale~A~Bration! Cake and Ice cream - this cute and Free stamp set covers it all! Who doesn't want a sweet birthday wish with style? This cool banner of a birthday wish is easy to assemble. Stamp the image with Jet Black Stazon Ink on the Whisper White card stock. Color it in with the Soft Sky, Pear Pizzazz (paired together with the aide of the Color Coach) and the So Saffron Stampin' Write Markers for a perfectly color coordinated look! I love that our papers, inks and ribbons/accessories all perfectly match for outstanding (but easy) results! 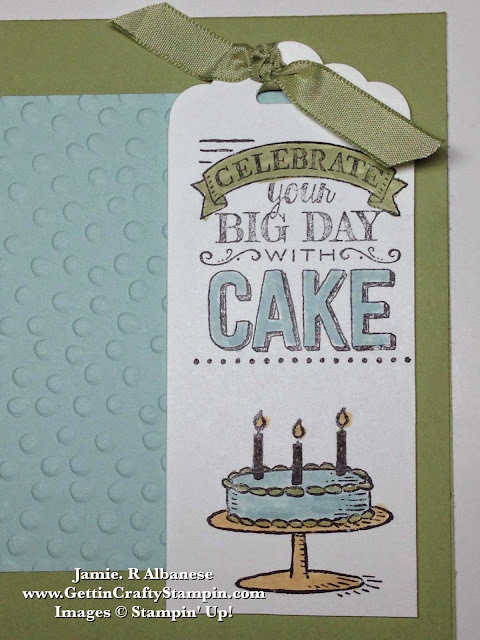 Adding a fun and whimsical texture takes the layered Soft Sky card stock to a new level! 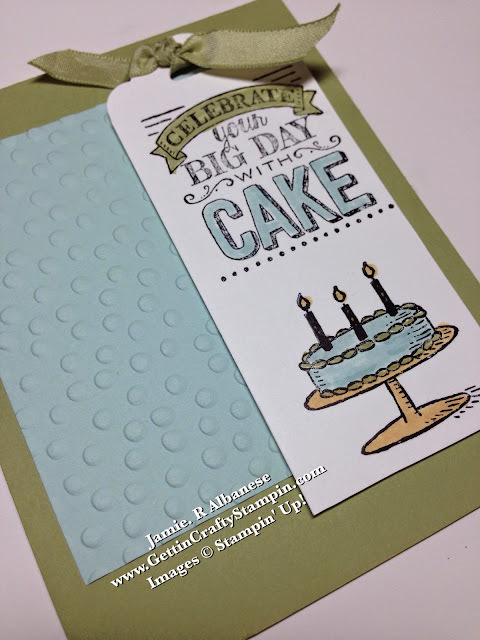 The Big Shot and Decorative Dots embossing folder makes a fun accent. 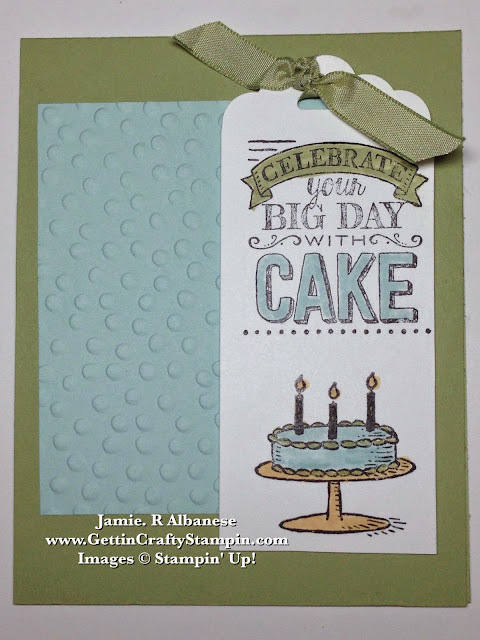 Use the Stampin' Dimensional adhesive to raise the stamped image above the embossed layer. OK, so this silly, gregarious, loud, wine making and drinking Italian man is my Father-In-Law. He goes about trying to make everyone laugh. I just couldn't resist sharing him with y'all - straight from Regio Calabria, Italy - he's a whoot! 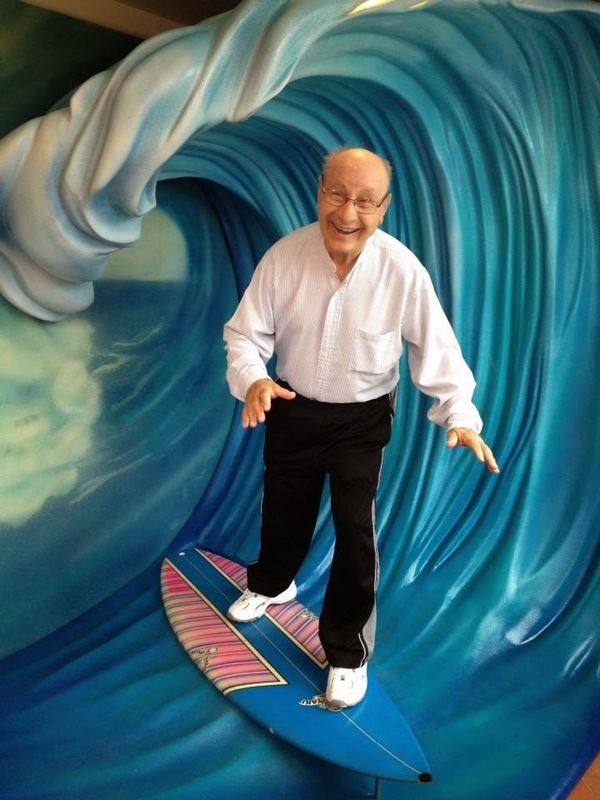 A man who loves his family and is a great Nonno (Italian for Grandpa). Happy Birthday Pa! Deliver some sweet Birthday greetings this year! Calorie Free wishes that are only better as the stamp set is FREE (for a limited time!). This stylish and fun stamp set makes for a great birthday card. Easy to personalize with colors, punches and accessories for a custom but good looking hand-crafted card. Join me in blessing others with cards this year - from celebrations to just-because, this will be a fun way to bless others all year long!